Ruby Fortune Casino, which was launched in 2003, is one of the six casinos that belong to the prestigious Palace Group. The online casino is almost synonymous with the latest technology, and loyal players say that the customer care service at Ruby Fortune is one of the best in the industry. Ruby Fortune says that it strives to gives its player community the fairest, safest, easiest, and most entertaining casino gaming experience in the industry. The online casino, which operates on the Microgaming software platform, bears the eCOGRA Fair and Safe certificate. US players are not accepted; neither are players less than 18 years of age. Ruby Fortune bears a license issued by the Lotteries and Gaming Authority (LGA) of Malta. Ruby Fortune Casino utilizes a clean, creative and simplistic layout to promote a one of a kind online casino experience. The website is decorated in numerous shades of purple, and it’s incredibly easy to navigate. All the different sections on the homepage are perfectly placed to ensure you don’t spend too much time searching for a specific game, news article or promotion. Unlike many other casino sites, Ruby Fortune only uses a few sections to keep to a simple layout that everyone understands and feels comfortable with. Ruby Fortune provides you with the most basic sections, which is conveniently located at the top of the page. 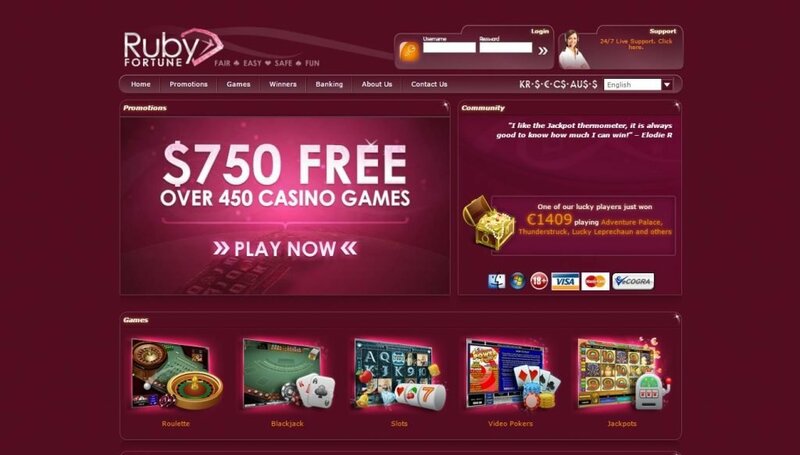 Upon opening the casino site, you will notice seven sections displayed under the Ruby Fortune Casino logo and includes a return to home page button, promotions, games, winners, banking, about us and contact us. The home button simply returns you back to the homepage while the promotions section gives you up-to-date information on the latest sign-up offers. The games section opens a lobby where you can search for a specific game or use the game filters located on the left-hand side panel. The game filters include 3-reel slots, 5-reels slots, Baccarat, Blackjack, Fruit Machines, Instant Wins, Live Casino, Table Games, Progressive Jackpots, Roulette, and Video Poker. The winner’s section is a wonderful addition that showcases all the latest winners and includes the amount they won, the date they won the amount and the different types of games played while they were on a winning streak. You will also notice the progressive jackpot meter for various games on the right-hand side of the winners’ page. The banking section displays all the available payment methods to deposit and withdraw and can also be filtered by country for your convenience. The about us section provides you with an overall view of Ruby Fortune Casino and what they provide to the online casino community, and you can read more about the independent auditors and responsible gaming by clicking on the links provided on the page. Lastly, the contact us section provides you with all the necessary information to get in touch with their support team if you have any queries or requests. Displayed at the bottom of every page is several additional links that include frequently asked questions, terms, and conditions, privacy statement, copyright, responsible gaming, affiliate program, promotions, loyalty program, VIP, mobile, and blog. So, if you don’t feel like using the sections provided at the top of the page, you are more than welcome to use the links provided at the bottom of the page. Furthermore, you can also select your desired language with the drop down box displayed at the top of the page and log in directly from the homepage if you already have a registered casino account with the casino. Ruby Fortune welcomes newly registered players with a hot welcome bonus of €750, spread over players’ first three deposits. As soon as players make their first deposit, they will receive a match bonus of 100% up to €150. Players can then claim a second deposit bonus of 50% up to €200 and a third deposit bonus of 25% up to €400. In addition, the online casino awards a special bonus of €1000 to any player who wins a progressive jackpot worth more than €25,000 by playing any progressive jackpot game at Ruby Fortune. Players should sign in to receive Ruby Fortune’s monthly newsletter in order to stay updated on all the latest promotions and offers at the online casino. Ruby Fortune Casino offers hundreds of Microgaming casino games, which you can play in US Dollars, Australian Dollars, Canadian Dollars, or Euros. The slot games offered at Ruby Fortune Casino are all powered by Microgaming and includes a wide variety of 3-reel slot games like Fantastic 777, Cherry Red, Rock the Boat, Fortune Cookie and 5-reels slots with popular game titles such as Winning Wizards, Sun Quest, Reel Thunder, Totem Treasure and many more. If slots are not really your type of game, Roxy Fortune has a great selection of table games that include three variants of Baccarat, 32 variants of Blackjack, 8 variants of Roulette, Sic Bo, Craps, Triple Pocket Hold’em Poker, Red Dog, Three Card Poker and High-Speed Poker multi-hand. Ruby Fortune also adds more excitement to your game play with over 20 different video poker games including; Jacks , Double Joker Poker, Tens or Better, All Aces Poker, Aces and Eights and more. The progressive jackpot game collection is more than enough to keep you entertained with 15 different progressive jackpot games featured at the casino. The most popular progressive jackpot games include Mega Moolah, Treasure Nile, Fruit Fiesta, Major Millions and Wow Pot. The live casino section might be limited, but you can still enjoy a game of live casino hold’em when you want to feel like you’re playing at a land-based casino. Ruby Fortune mobile lets you take this top-notch online casino to any destination while you on the move, ensuring you don’t miss a single spin. You will be able to enjoy an unbeatable variety of casino games from your smartphone or tablet device. The Ruby Fortune casino lobby has been perfectly optimized to cater for all mobile devices including WAP, Blackberry, iPad, iPhone and Android. Ruby Fortune received an award for the best online casino app in 2014 as well as 2015. This is a clear indication that they strive for excellence and provide their players with the best online gaming experience while on the move. Ruby Fortune also uses award-winning Microgaming software that sets them apart from other online casinos. Unlike most Microgaming online casinos, Ruby Fortune has a considerably smaller list of restricted countries that will not be able to sign up and play with them. The restricted countries include Belgium, United States, Denmark, Spain, France, Hungary, Hong Kong, United Kingdom, Italy, Malaysia, Singapore, South Africa, Taiwan, Iran, and Israel. Ruby Fortune Casino offers a multi-lingual customer support system, available for 24 hours per day and 7 days per week. Aussie players can use the toll-free support number 1-800-76-9359. In addition, to live chat, the online casino offers toll-free numbers for Canada (1-800-76-1965) and for the rest of the world (+44-800-328-7749). Players can also send an email to support@rubyfortunecasino.com. Ruby Fortune Casino also has an exhaustive Frequently Asked Questions (FAQ) section, where players can find answers to commonly asked queries. Ruby Fortune is a fun and reliable casino featuring a collection of Microgaming powered games. The casino software is available in instant-play mode, download version and on most mobile devices. The support team at Ruby Fortune Casino can be reached through live chat, telephone or email and are available around the clock for any queries you might have for them. Furthermore, your personal information such as your credit card details, password and username is protected by a 128-bit SSL encryption to ensure no one gets their hands on your details, making Ruby Fortune a safe and secure casino site. The casino is also audited on a regular basis by eCOGRA to ensure fairness is guaranteed with every spin you make. Ruby Fortune does have disadvantages that includes the extended pending period on all withdrawals that can take up to 96 hours to receive your funds and there are also players from the United States and a few other countries that will not be able to enjoy the online experience set out by Ruby Fortune. If online casino players are looking for a safe and reputed place to gamble away their hard-earned money, Ruby Fortune Casino is the best online casino for them. One of the most reputed brands in the industry, the online casino pampers its players with bonuses and a huge portfolio of Microgaming titles. To get started, players just register a real play account and make a deposit using any of the safe and reliable banking methods accepted at the casino. You will be able to enjoy the best online casino games in the world coupled with a fantastic support team that has been well-educated to assist you with any request or query you might have. Ruby Fortune also provides the best mobile experience in the world as proven by their two recent awards for the best online casino app.